Posterity has been very harsh to our pre-eminent neoclassical architect, Sir John Soane. His great public buildings in London have been demolished, and his private country houses have been pulled down, drastically altered or rendered derelict. The two most notable creations that survive are 11-14 Lincoln’s Inn Fields, in Holborn, and the Dulwich Picture Gallery. The sober brick façade of the latter is about to suffer the indignity of having a garish pavilion of Nigerian inspiration erected in its grounds. Most tragic is the disappearance of the Bank of England, Soane’s lifelong masterpiece; he was its architect and surveyor for 45 years. 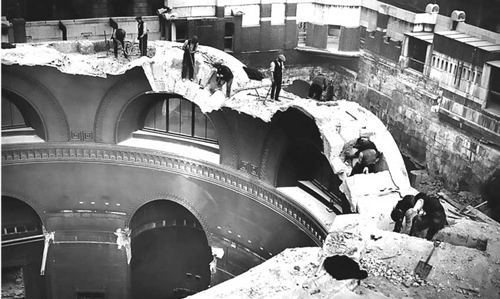 After the First World War, to create more office space, its series of magnificent, domed, top-lit halls, subtly linked within a cramped, irregular site, was destroyed. Pevsner called it ‘the worst individual loss suffered by London architecture in the first half of the 20th century’. Today, only the blind retaining wall survives. Other serious losses include the Privy Council Chamber in Whitehall, the Law Courts at Westminster, and the Freemasons’ Hall in Covent Garden. Outside the capital, Tendring Hall, in Suffolk, an early work, was demolished after the Second World War; the interior of Tyringham Hall, in Buckinghamshire, was completely remodelled in the early 20th century; and others – Wotton House, in Buckinghamshire; Moggerhanger Park, in Bedfordshire; and Pell Wall Hall, in Shropshire – were reduced to wrecks. The rescue of a Soane building is, therefore, a cause for rejoicing. This March, Pitzhanger Manor, in Ealing, west London, will reopen to the public after a four-year restoration costing £12 million. The house is of particular interest because, along with Lincoln’s Inn Fields, it was where the architect lived. In 1800, he bought the manor and 28 acres of parkland for £4,500. He knocked down the existing house, save for the Georgian south wing, which was designed by George Dance, the ‘revered master’ for whom he had worked at Pitzhanger as an apprentice. Completed in 1804, the Regency manor was a country retreat for a man who had attained renown at the Bank of England. It was a showcase for his architecture and his collection of antiquities and paintings, and a place for entertaining; among his guests were Turner and the Duc d’Orléans, later King Louis Philippe of France. It would also, he hoped, inspire his two sons, John and George, to become architects. His wife, Eliza, did not take to country life and his ambitions for his sons were to be bitterly disappointed. George, having been jailed for debt, went as far as to attack his father’s works in print, and Soane blamed him for Eliza’s death in 1815. 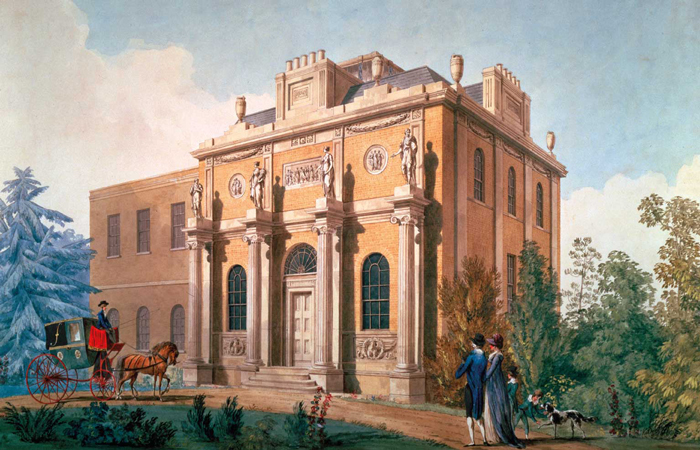 Helen Dorey, deputy director of the Soane Museum, in Holborn, suggests that the architect was already thinking of putting Pitzhanger on the market in 1806. In the event, he sold it four years later for £10,000 and moved its contents, including Hogarth’s A Rake’s Progress, to expanded accommodation in Lincoln’s Inn Fields. Partial restoration of Pitzhanger, undertaken by Ealing Council in the 1980s, was restrained by lack of means. Money for the present work has come largely from the Heritage Lottery Fund, Ealing Council and the Arts Council England. The local borough has granted a long-term lease on the property to the Pitzhanger Manor and Gallery Trust.Outside, the Victorian infill between the house and the old kitchen block has been demolished, revealing the four fluted pilasters of the north façade. An Edwardian extension on the west side, overlooking the park, has been removed and the conservatory, where Soane displayed his antique statues and urns among the plants, reinstated. The public library, which had taken the place of the kitchen block, has been converted into an art gallery, lit by three circular skylights. Its first exhibition will be of the sculptor Anish Kapoor. In the space created by the demolition of the infill, the original colonnade has been recreated. The house is topped once again by a skylight with pieces of blue and amber glass, also to be found in the fanlight above the front door and in the conservatory. Roundels have been inserted on the park façade and urns returned to the roof. Even more impressive is the transformation of the interior through the reinstated skylight, the sash windows of the conservatory, and an oval, clear-glass opening whose light is filtered through orange and yellow windows surrounding the unblocked tribune, the arcaded opening between ground and upper floors. Freed from Victorian whitewash, the restored decoration is sensational: the painted marbling effect in the entrance hall (pictured); the starfish canopy ceiling of the library, with its trompe-l’oeil trellis and flowers; the sky-coloured oculus, key patterns and winged figures of the domed breakfast room; the red, blue, green and cream of the upper drawing room in the Dance wing and its recreated Chinese floral wallpaper; the blue, green and cream of the eating room below. In the words of Clare Gough, director of Pitzhanger, the manor has become ‘a jewel box of a building’. In the meantime, Soane’s ‘pleasure grounds’ have been enhanced through a £2.4 million Lottery grant to Ealing Council. Improvements include a new café and replanted beds in the walled kitchen garden and, in Walpole Park, repairs to Soane’s stone bridge, the pruning and propping of two cedars of Lebanon, probably planted in the mid-18th century, and the recreation of two original water features. Understandably, the current focus is on Pitzhanger. But the three wrecked country houses mentioned earlier should not be forgotten. Wotton House was facing demolition when it was bought in 1957 by Elaine Brunner. She restored most of the Soane features which had been concealed in an earlier renovation, and her work has been continued by David Gladstone, her son-in-law, culminating in the reopening of the tribune in 2015. Moggerhanger Park, semi-derelict, was sold by Bedfordshire County Council in 1987 to a property developer, who planned to convert it into offices and add an open-plan extension and a car park. Conservationists intervened and English Heritage raised its status from Grade II* to Grade I. 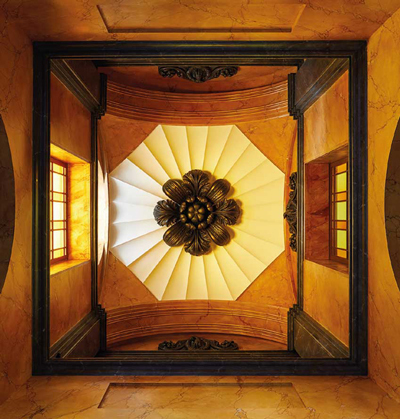 Familiar Soane features – top-lit stair hall, tribune, pendentive-domed entrance hall, telescopic chimney stacks on the kitchen block – have been restored. Owned by a trust, the house now operates as a wedding and conference venue and a four-star B&B. The interior of Pell Wall, Soane’s last completed domestic house, was remodelled and given a south wing in the 1870s. It fell into disrepair and was gutted by fire in 1986. Having acquired it by compulsory purchase, the local council sold it to a trust, which removed the Victorian and Edwardian additions and rendered the burnt shell waterproof and structurally sound. Bernard Goodwin, director of a family engineering firm in Stoke-on-Trent, bought the house in 2010 and, advised by the Soane Museum, has recreated the interiors. He now lives there with his young family and hopes to complete the work, including reconstruction of the original portico, with Doric columns topped by an acanthus-type shell, within the next two to three years. Soane witnessed the eclipse of neoclassicism in his own lifetime, as taste turned towards the Gothic. Reassessment of his work in the early 20th century was not enough to save the Bank of England. Since the Second World War, his reputation as an idiosyncratic genius, both conventional and deviant, classical and modern, has grown. For that we must thank the continuing rescue of what is left to us.